View of the ICJ courtroom on 2 February 2017 at the delivery of the Court’s Judgment on Somalia v Kenya. 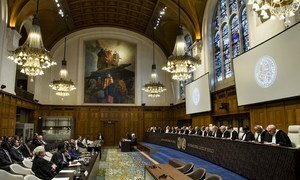 The International Court of Justice – the principal judicial organ of the United Nations – today issued a verdict, admitting an application submitted by Somalia, over the maritime delimitation between it and Kenya in the Indian Ocean. In its final judgement and without appeal, the Court rejected objections raised by Kenya which referred to a memorandum of understanding and the UN Convention on the Law of the Sea, and found that it has jurisdiction to entertain Somalia's application and that the application is admissible. In August 2014, Somalia had approached the Court, requesting it to determine, on the basis of international law, the complete course of the single maritime boundary dividing all the maritime areas appertaining to Somalia and to Kenya in the Indian Ocean, including the continental shelf beyond 200 nautical miles (370.4 kilometres or 230.156 miles). According to media reports, Somalia believes that the seabed area under contention could hold possible oil or natural gas reserves. As basis for the Court's jurisdiction, Somalia invoked the declarations recognizing the Court's jurisdiction as compulsory made by the two States. Kenya, however, raised two preliminary objections. The first concerned the jurisdiction of the Court: Kenya argued that the Court lacked the jurisdiction as a result of one of the reservations to its declaration accepting the compulsory jurisdiction of the Court, which excludes disputes in regard to which the parties have agreed “to have recourse to some other method or methods of settlement”. Kenya asserted that the memorandum of understanding constituted an agreement to have recourse to another method of settlement. It added that the relevant provisions of Convention on the Law of the Sea on dispute settlement also amounted to an agreement on the method of settlement. In the second objection, concerning the admissibility of the application, Kenya argued that the two countries had agreed in the Memorandum of Understanding (MOU) to delimit their boundary by negotiation only after the completion of the Commission on the Limits of the Continental Shelf (CLCS) review of their submissions. Kenya also contended that Somalia's withdrawal of its consent to the consideration by the CLCS of its submission was in breach of the MOU. The Court concluded that the MOU did not constitute an agreement “to have recourse to some other method or methods of settlement” within the meaning of Kenya's reservation and consequently the case did not, by virtue of the memorandum of understanding, fall outside the scope of Kenya's consent to the Court's jurisdiction. It further concluded that neither the memorandum of understanding nor the relevant part of the of UN Convention on the Law of the Sea fell within the scope of the reservation to Kenya's optional clause declaration and rejected Kenya's preliminary objection to the jurisdiction of the Court, also having previously found that the memorandum of understanding did not contain an agreement as stated by Kenya, the Court rejected that aspect of Kenya's second preliminary objection. Lastly, the Court also rejected the preliminary objection to the admissibility of Somalia's application given its objection to CLCS consideration of Kenya's submission, finding that it did not render the application inadmissible. Additional information concerning the case can be found on the International Court of Justice website at http://www.icj-cij.org/homepage/index.php?lang=en and http://www.icj-cij.org/docket/index.php?p1=3&p2=3&code=SK&case=161&k=00. The International Court of Justice (ICJ), the principal judicial organ of the United Nations, has delivered its Order on the case concerning Immunities and Criminal Proceedings(Equatorial Guinea v. France) and the request by Equatorial Guinea to indicate provisional measures.